Here in Israel, we're burning. Southern Israel is suffering from a burning plague of Arab terrorism. Cheered on by various NGOs and supportive countries, the Hamas terrorist Gazans have been launching incendiary kites, balloons and other devices at Israel. The clips and photo are from מחאת הדרום - "דין עוטף עזה כדין תל אביב"
The international media has been ignoring the terror here, but they publicize the death of rioters and terrorists as if they were innocent bystanders. Nobody cares about Israel. 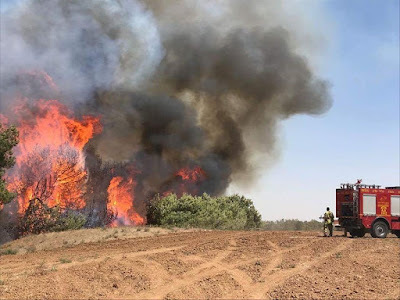 Arab terrorists are burning our land, fields, orchards and more. It's only due to Gd's mercy and love for us that the fire weapons launched by the Gazan terrorists at us haven't burnt up homes, schools, clinics etc. The fact that numerous Israelis haven't been killed isn't because these weapons aren't dangerous. The Arabs want to kill us. And the world doesn't care. For that I am burning with anger! If they Arabs cared about the Land, they'd treasure it and not burn it. I'm burning with anger that the world sympathizes with the terrorists and not the victims. Deja vu, so much like the 1930's and the rise of the Nazis in Germany, then Europe. Nobody cared about the discrimination and then systematic murder of the Jews living there. Nothing's new, and I'm burning with anger!ger!